Two men have been ordered to serve at least 25 years in jail for the murder of a 91-year-old woman in her home. 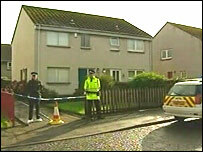 Patrick Docherty, 41, and Brendan Dixon, 36, were found guilty of killing Margaret Irvine in Galston, Ayrshire, during a botched robbery in 2003. 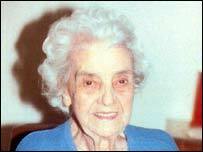 Lord Hardie said the "wickedly reckless and truly evil" crime was "beyond the comprehension of all decent people". He jailed the pair for life after they were convicted by a jury at the High Court in Kilmarnock. He ordered that they must serve 25 years before they will be eligible to apply for parole. The case against a third man, 32-year-old James Miller, was found not proven. The frail pensioner, who lived alone, was bound and beaten before a duster was shoved in her mouth and a pillowcase pulled over her head. The four-week trial heard that Docherty and Dixon broke into Mrs Irvine's home on Barward Road, switched off the electricity and struggled with the pensioner. Docherty, of Hillcrest, Bellsbank, Dalmellington, and Dixon, whose address was given as Kilmarnock prison, denied the charges. Passing sentence, Lord Hardie said: "Your actions defy description and were beyond the comprehension of all decent people." He said the pair had attacked Mrs Irvine in "the sanctity of her own home" with a view to robbing her of her life savings. "Such an assault is properly described as wickedly reckless," he said. "There may even have been intent to kill. Whatever the case, it was truly evil." The judge said both men had shown a lack of remorse and added to the distress of the family by not pleading guilty. 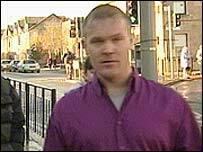 The court heard that Docherty had 54 previous convictions, involving more than 120 offences. Dixon, who had 30 convictions for 48 offences, was also sentenced to five years for attempting to defeat the ends of justice. That prison term will run at the same time as his life sentence. However, Docherty was later sentenced to an additional year in prison after making a remark to the jurors. As he was being led away he said: "I hope you can sleep at night". Lord Hardie said the remark distressed more than one of the jurors and found Docherty guilty of contempt of court. "It is time that people realised that it is not for them to call into question or to comment to jurors after a verdict," he said.